This is a worksheet I always use for Basic1 students. I use it as a review before test. I let Ss do it in the class so I can move around and help them if they needed. It contains personal information, time, countries and nationalities. 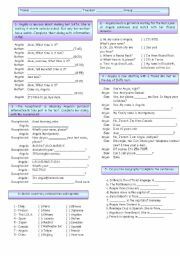 Workesheet to practice Passive voice. A good song to present wishes and regrets. This song is much known among teachers. It very useful when teaching Simple Past. Students have to fill the blanks with the past form of the verbs in the brackets. It also includes the song history and band information. Hope you like it. 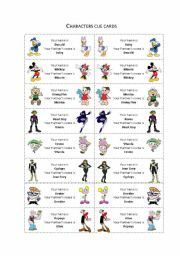 Characters cards for greeting activity. Intructions included. 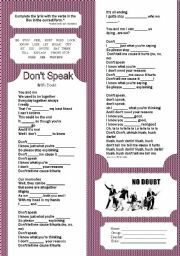 I used this song when teaching In this worksheet students have to fill the blanks with the correct form of the verbs in the box. The verbs are in the Present Simple, Present continuous and -ing forms. Hope you like! 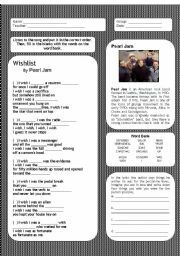 Song used for Simple Past. Students should listen the song and circle the verbs in the past. Then, they should find the base form of the verbs in the word-search. 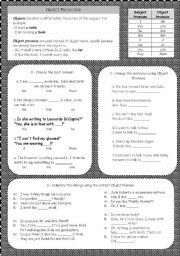 In this worksheet there is brief explanation of Object Pronouns and some exercise to practice the use of them. 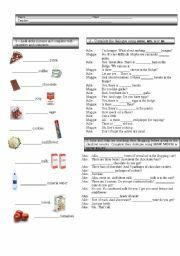 Hope it�s useful. 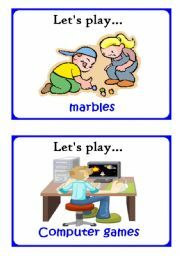 This worksheet is very fast activity to revise countable and uncountable nouns. The first activity is about quantities and containers. In the second Ss have to complete with some, any, a or an. And in the third Ss have to use how much or how many.